Lev Vasilyevich Ovsyannikov is an outstanding Soviet scientist who has made the major contribution to the development of mechanics and applied mathematics. His works served as the beginning of the new scientific fields actively developed in our country and abroad. L.V.Ovsyannikov's results in gas dynamics, in the theory of liquid movement with the free boundaries, and in the field of mathematical substantiation of models of continuous medium mechanics became the classic ones. The methods of the group analysis of the differential equations developed by him are widely applied in various fields of mathematics, mechanics, and theoretical physics. L.V.Ovsyannikov has created the scientific school widely known in the world science. Lev Vasilyevich Ovsyannikov was born on April, 22nd, 1919 in the city of Vasilsursk in Volga region. His father worked as the land surveyor, and mother worked as a teacher. After family of L.V.Ovsyannikov moved to Moscow, he leaves high school in 1937 and enters the Moscow university. The first months of war L.V.Ovsyannikov works in the construction of the defensive works. In autumn 1941, he graduates from the university and gets the direction to the Leningrad military-aerial engineering academy as a listener. Upon graduating from the academy in 1945, he becomes post-graduate of LKVVIA (LCHMEA) and gets the PhD thesis in 1949. From 1948 to 1953 L.V.Ovsyannikov works as the professor in LKVVIA and in Leningrad university. 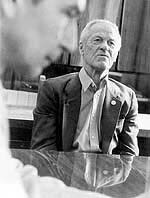 In 1953-1956, he is in the research work in the field of applied mathematics in Moscow. Since 1956 L.V.Ovsyannikov is a senior lecturer of MITP. In 1959, on the invitation of academician M.A.Lavrentyev, he moves to work in the newly created Siberian Branch of AS USSR and there he becomes one of the first research associates of the Institute of hydrodynamics of SB AS USSR. In 1961 L.V.Ovsyannikov has maintained a thesis to qualify to the doctoral scientific degree in physics and mathematics. In the Institute of hydrodynamics, he passes on the way from a senior research assistant to director, the principal of the large scientific community. In 1964, L.V.Ovsyannikov is elected a corresponding member, and in 1987, the full member of the Academy of sciences of the USSR. The first scientific works of L.V.Ovsyannikov that were executed in the late 40s – early 50s deal with gas dynamics, with the theory of the transonic fluxions. He has considered the gas flow in the transonic part of Laval nozzle in the case when the sound line is straight. Known computational methods of hyperacoustic part of the stream did not allow considering the features of gas flow in the neighbourhood of the degeneration line. The analysis made by L.V.Ovsyannikov made it possible to find out and classify for the first time the special points in the straight sound line, to give an expression for the main term of the asymptotic solution, and to develop the simple approximate computational method of a near-sonic flow in Laval nozzle with the straight transition line. In his work on the motion of a cuneiform profile with the velocity equal to sound velocity, L.V.Ovsyannikov suggested the method of constructing the approximate solution of Tricomi problem arising in the description of gas flow. The found solution made it possible to calculate the field of the mixed flow, to find a shape of transition line, to define the value of drag for the cuneiform profile. In examination of the problem about the flow of the subsonic jet with critical velocity at the boundaries, L.V.Ovsyannikov's has found that the jet alignment occurs at a definite distance from the hole. This striking analytical effect has drawn attention of experts in the field of gas dynamics and the theory of the differential equations. At present, studying the questions of localization of solutions of degenerating differential equations represents a particular scientific direction. L.V.Ovsyannikov's work is one of the first ones, who pioneered in this direction. 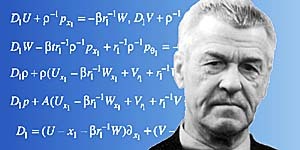 In connection with the necessity to develop the effective methods of solution the problems of the transonic gas dynamics, L.V.Ovsyannikov carried out an examination of the generalized solutions of Tricomi problem for Euler-Darboux equations. He has suggested for the first time a constructing method for the full system of particular solutions for these equations and has given the substantiation of the least square method, by means of which decomposition coefficients of Tricomi problem solution over the full system of basic functions were calculated. The problems of gas dynamics take also an important part in the subsequent periods of L.V.Ovsyannikov's work. In 1960-70s, he has found the convergence of Meyer expansions featuring gas flow in the transonic part of a rotationally symmetric nozzle, and explored the spatial transonic streams with the flat sound surface. In 1972, he developed a method of the approximate recalculation of the law of shock waves distribution in a nonuniform medium. L.V.Ovsyannikov paid the major attention to the development of methods for searching the exact solutions. Interest to this question, arising during the analysis of the equations of gas dynamics, has resulted in a large cycle of investigations. In 1958, L.V.Ovsyannikov has published the work " Groups and invariant-group solutions of differential equations " that started the systematic studies in the field of group analysis for the differential equations of mechanics. The basis of this theory is provided by the concept of the continuous transformation group that was introduced by Norwegian mathematician S.Lie in the second half of the last century. Knowledge of the transformation group allowed by the system of differential equations enables one to analyze the structure of the set of its solutions. L.V.Ovsyannikov introduced the notions of invariant and partially-invariant solutions and suggested the simple and effective algorithms for their constructing. The group-theoretic approach created an opportunity for the regular search and classification of particular solutions of the non-linear differential equations. In classification of group invariant solutions, L.V.Ovsyannikov has suggested to use their integer characteristics, rank, and invariance defect. The notion of the reduction of partially-invariant solutions developed by him plays an important part in the problem of classification. Application of general algorithms gave rise to the new solutions even for the equations of mechanics of continuum that were explored for a long time. He also discovered that automodel solutions, the multiple waves, and functionally invariant solutions have the group-theoretic nature. On the basis of theorems established by L.V.Ovsyannikov on the reduction of partially-invariant solutions to the invariant ones, he proved that non-reducable double waves of two-dimensional non-steady gas dynamics are isentropic. This result demonstrates that the concept of reduction allows one to extend the known property of isentropic nature of simple waves to cover also the double waves. *Source: Lyev Vasil'yevich Ovsyannikov: (K syemidyesyatilyetiyu so dnya rozhdyeniya) // Prikl. matyematika i myekhanika. - 1989. - T.53, vyp.2. - S.179-183. Dokumyent izmyenyen: Wed Feb 27 14:46:42 2019. Razmyer: 12,631 bytes.